Jays Sporting Goods was founded in 1971 by Jay Poet when he turned his small garage on 7th Street in Clare into a sports shop. Three years later the first official Jays Sporting Goods store was opened and in 1988 its current store in Clare was completed. 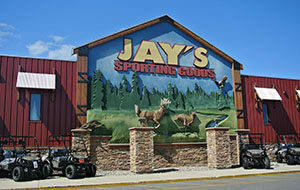 At 72,000 square feet and filled with fishing, hunting, camping and hiking equipment, Jays Sporting Goods is Michigan's original outdoor superstore. Jay's Sporting Goods was founded in 1971 by Jay Poet when he turned his small garage on 7th Street in Clare into a sports shop. Three years later the first official Jay's Sporting Goods store was opened and in 1988 its current store in Clare was completed. At 72,000 square feet and filled with fishing, hunting, camping and hiking equipment, Jay's Sporting Goods is Michigan's original outdoor superstore.